So, naturally, you want the best for your dog: the best foods, treats, and medical care. But there are SO many choices available that it's really hard to make the right decision--especially if you're an FTCP (first-time canine parent)! Buster and his 'mom' (me) can help you sift through all the information that's out there. We've got first-hand experience in feeding holistic foods and treats, and information on what NOT to feed your CBF (canine best friend). We've 'test-driven' some of the most popular toys and accessories, so we know what 'canine kids' prefer--and what toys aren't worth the time. We'll also give you tips on holistic vet care, nutritional supplements, games and exercise, grooming, safety tips, pet-friendly vacation ideas--everything you'll need to enjoy life with your furry pal. (Sorry, couldn't resist...) Buster hopes you had a crazy, fun, and blessed holiday season. Now it's time to take down all the holiday decorations (if you haven't already done so) and move onto 2014. Have you made any yet? Are they those of the 'same old, same old' variety? You know, like losing weight, getting in shape, getting a better job (which may be tough in this economy), being nicer to others...most people end up breaking their resolutions within a month of making them. (Sad but true.) Here's a resolution that will benefit both you and your CBF: Spend more time playing together. Depending on what size and breed your dog is, more playtime could mean something as simple as throwing toys for him to fetch--or it could mean trying a new sport involving both of you. For example, if you live in an area that gets snow in the winter (like here in Michigan), you could try skijoring, which is kind of a mash-up of cross-country skiing and dog-sledding. If you prefer indoor activities, you might try learning agility, flyball, or freestyle. Check out our pages on these fun indoor sports to learn more. If you live in a warmer climate, just hitting the trails with your CBF is a great way for the two of you to blow those cobwebs out of your brains and grab some fresh air and exercise. If you and your dog are headed outdoors for some winter fun, make sure both of you are dressed for the elements. If you have a smaller, thinner, or short-coated pup, he should wear a sweater or coat if the temps are below 40 degrees. Also, it's a good idea to invest in some booties for your pet. I know they don't like to wear them, but these will protect their paws from sharp ice shards and road salt--and the added benefit of keeping their little doggie toes toasty. There are several brands on the market, but we like Muttluks Dog Booties . They're a little on the pricey side, but the cost is a lot less than a trip to the veterinarian to repair a cut paw pad. If you do get booties for your pup, let him wear them indoors for several hours first so he's accustomed to them and doesn't try to chew them off his feet. Much of the northern and northeastern parts of the United States have experienced extremely harsh temperatures in the past several days. Here in the Metro Detroit area, the temperature got down to -14F on January 7th--and that's the actual temperature. We also had 30 mph winds which brought the 'real feel' (windchill) down to -35F. And parts of the country (like North Dakota) were even colder. Exposure to these temperatures is very dangerous not only for humans but also for their pets. PLEASE KEEP YOUR DOG INDOORS IN THIS EXTREME COLD WEATHER.. I CANNOT emphasize this enough. An insulated dog house is NOT adequate protection in temperatures which can cause frostbite in less than 5 minutes. 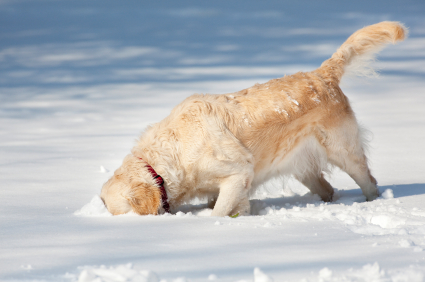 Your dog will freeze to death if left outside in this weather. Also, if you're running errands, don't leave your dog in the car. Vehicles are not insulated (if you've noticed, the interior loses heat very rapidly when the engine is turned off) and the car becomes a refrigerator. We at Buster's Dog House hope you have a fun and safe winter! Taking a trip with your CBF? Check out our Travel Tips page for a list of the top 10 pet-friendly resorts in the United States. If you live in a warm climate, your dog should be getting heartworm preventive year-round. Also keep giving flea and tick preventives. There are some species of tick that survive year-round even in cold climates. Is your CBF afraid of thunderstorms or other loud noises like fireworks? Of course, both of these are very common in the summer (in my neighborhood in the metro Detroit area, Fourth of July starts sometime in April and ends sometime in October), and many dogs become somewhat unglued during this time. Or maybe you're in the process of moving to a new home, and your dog is exhibiting a higher anxiety level. If you're looking for something to help your dog feel more calm and secure, we recommend the Thundershirt . This is a snug garment that your dog wears that produces an effect similar to swaddling an infant which is very soothing. **We recently found out that this same company makes a Thundercoat as well for those colder winter days. If you have more than one dog who's having this type of issue, you could try the Comfort Zone With D.A.P. For Dogs Plug In With 48ml Bottle . DAP (Dog-Appeasing Pheromone) mimics the scent that a mother dog exudes while she's lactating, which is very soothing to most dogs. Still Big on Our List of Faves! We recently wrote about a FABULOUS new healthy frozen treat from one of our favorite companies, The Honest Kitchen. They're called Ice Pups and they're a terrific alternative to the 'doggie ice cream' in your supermarket's freezer. Made with yummy (and healthy) ingredients like dehydrated chicken, turkey, dandelion, watercress, parsley, and asparagus (yes, asparagus) with a little honey to add sweetness, Ice Pups are super-easy to make. You just pour a packet into an 8-ounce mug and fill with warm water. Stir or whisk (this actually works better) until blended, pour into ice cube trays, and freeze. Give a couple of these to your CBF as a treat (dessert maybe?) and he'll forget all about that other unhealthy treat. BTW--Ice Pups are much less fattening than that other stuff and can also be served as a warm liquid. We're trying to win over our Chocolate Lab friend Hunter's mom with Ice Pups since Hunter has gained almost 10 lbs. from eating the 'other' frozen treat. Another good thing about Ice Pups? Since they're a dehydrated powder, they're packed in convenient foil pouches--no refrigeration necessary until you've made them. The REALLY cool thing about Ice Pups?? They're just as terrific served as a warm brothy treat! Just follow the directions as above, but instead of freezing them in an ice cube tray, simply pour into your CBF's dish and watch him enjoy. What a great way to warm up his tummy after playing out in the snow! Okay, I guess I was wrong...I DID get Christmas presents. I guess Santa decided that I was still cute even though my little sister Tara the Terror begs to differ. But I got the BEST Christmas present after the holidays: SNOW!! I LOVE snow. I like to tunnel in it, roll in it, make snow angels, eat it...I think you get the picture. We've had two big snowstorms since New Year's Day and now there's almost two feet of the fluffy white stuff for me to enjoy. And my heavy double coat keeps me nice and warm. Playing in the snow is MY time. Tara has short fur and gets cold easily, so she doesn't want to stay outdoors. Man, is she missing out! The Animal Rescue Site (https://theanimalrescuesite.com) is a website devoted to the feeding and caring for shelter animals. When you visit the site, be sure to click on the big purple button (it's free) to donate food for shelter pets. You can click every day if you like. This website also has TONS of really cool products, such as clothing and jewelry, for both humans and animals. The best thing? Every purchase you make helps shelter animals. Make sure you visit the website daily to click and help shelter animals! Click on any of the links below or the buttons on the left side of the page to check out our other pages. The Dog House Blog keeps you up-to-date on new pages or additions to existing pages on BustersDogHouse.com. Subscribe now. It's important to pick the right dog foods and treats for your dog's optimum health. Dogs need to be cozy and secure! Here are some of the best (and cutest!) dog beds. And if your CBF (canine best friend) requires a crate--or a dog gate--look here for some great ideas! Dog collars, leads, harnesses--your dog needs them, but how do you choose? Let Buster help! Looking for some great dog toys to keep your pup entertained? Buster lets you in on some of the the best dog toys for playtime fun! Dog clothing? You bet!! Let your dog make a fashion statement! Here are cute ideas for dog clothing, shoes, and accessories for your CBF (canine best friend)! The most important thing you can do for your dog is to keep him (or her) in optimum health. Careful monitoring of your dog's health at home as well as regular trips to your veterinarian can help. Alternative veterinary treatments (also known as 'holistic') can be used to treat some of your dog's illnesses and can also be utilized as complementary medicine with your dog's regular veterinarian. Giving your dog the right vaccinations at the right times can boost his health, happiness, and longevity. Finding the right veterinarian is the most important part of keeping your dog happy and healthy. But if your community has several vets from which to choose, how do you find the right one? It's happened--your dog has a minor injury. What to do? Buster's Dog House provides some basic first aid techniques you can use--but consult with your veterinarian first. If your dog spends any time outside during warmer months, it's almost certain he'll pick up fleas--and possibly ticks or other parasites too. Here are some suggestions to 'ditch the itch'. Unfortunately, your dog is susceptible to many of the same illnesses that humans can get--cancer, arthritis, Cushing's disease...the list goes on. However, all hope is not lost. Is your dog an energetic, fast pup? Dog agility is where speed, grace, fun (and lots of barking!) come together in one exciting, competitive sport. Ever see a dog run a relay race? Flyball is fast, furry fun!! Are you a cross-country ski buff? Do you have a big dog that loves winter? Then skijoring may be just the sport for both of you!! Looking for something different and fun to do with your dog? Do you like music and dancing? Then try freestyle! Thinking of bringing your dog along with you on a trip? This can be a lot of fun--or it can be a huge headache. 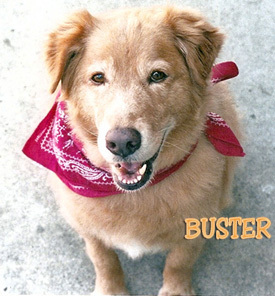 Let Buster help you make your trip easy and comfortable for both you and your CBF!! Your dog comes in the house covered in mud...or maybe you just can't remember the last time he had a bath. Perhaps he's a little stinky too...only one solution: Bath time!! Of course you love your dog--but you know there are many other pups that really need your help. Here are some of Buster's favorite charities. Does your dog love water and playing 'fetch'? If you're looking for the perfect sport, look no further!! Dock diving is competitive wet fun for you and your dog!! Buster's Dog House has linked up with some other cool dog-related websites! Check these out:! 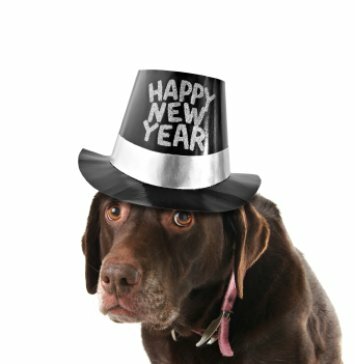 Holiday gifts for your dog? You bet! Here are some great ideas! Geocaching--A Scavenger Hunt With Your Dog! Searching for something new to do with your dog? Check out geocaching, the cool new recreational activity that's loads of fun for both of you! Would you like to share your knowledge about dog? Great, find out how you can submit your story or tip here. Copyright 2007-2013 BustersDogHouse.com *This site is for informational purposes only. The owner is not a licensed veterinarian.